Command Alkon Inc., Birmingham, Ala., has named Phil Ramsey president, a title in addition to the chief operating officer post he has held since 2005. 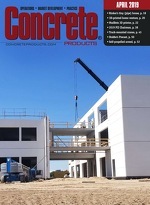 The American Concrete Institute (ACI) announces availability of new publications and CD-ROMs offering latest concrete-related information and technology. Contractors want concrete to be as workable as possible to facilitate placement and consolidation without compromising performance in the hardened state. The company's High Pressure Washout system reportedly offers faster cleanup time for 5 percent greater productivity and recoup on investment within months. Natural Concrete Products has developed a process to fabricate what the company describes as the most natural-appearing retaining wall block on the market. Jamieson Equipment Co., a major concrete plant and dry bulk material handling dealer in the Southeast, scheduled a four-day open house late last month. Owens Corning Names Chief For Cultured Stone Div. A new website titled Concrete and Concrete Products Manufacturing and Construction has been established by the Occupational Safety and Health Administration.